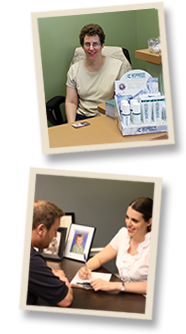 When you enter Davis Chiropractic as a new patient, our office manager, Ann, will greet you at the front desk. If you have not already downloaded and completed the new patient form, we will have you complete one at this time. Dr. Davis will discuss your health history with you and determine if chiropractic is a treatment option for you. After discussing your health history, Dr. Davis will complete a chiropractic physical examination which may include: testing flexibility, reflexes, neurological tests, orthopedic tests, postural analysis, and physical tests. If Dr. Davis determines from your health history and examination that you need X-ray studies before chiropractic care is recommended, she will refer you to another facility for X-rays. If Dr. Davis determines chiropractic care is an appropriate treatment option for you, she will explain how chiropractic may be able to help your condition, what will be done during the adjustment, and what to expect after the first adjustment. She will also answer any questions that you may still have prior to and or during the adjustment.